Gokuku-ji (護国寺, Gokuku-ji?) is a Buddhist temple in Tokyo’s Bunkyo-ku. It was established by the mother of the Shogun Tokugawa Tsunayoshi. 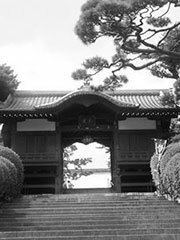 In 1873, Emperor Meiji declared Gokoku-ji the Imperial mausoleum, and several of his children are buried there, as well as Emperor Meiji himself. It remains the Imperial mausoleum today. Gokoku-ji is also famous as the central temple that oversees the practice of Japanese tea ceremony in all the country’s temples.